A couple of days before Father’s Day I handed BeeBop my copy of Hershey’s Classic Recipes and told him to pick out anything in it that he’d like for his special Father’s Day treat. 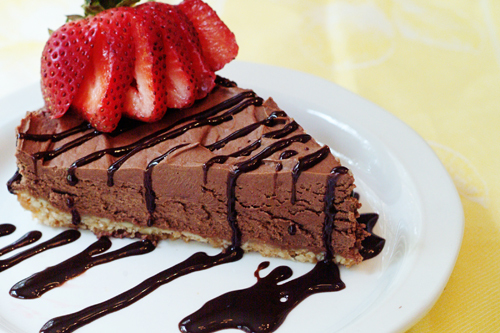 What he chose was this classic no-bake chocolate cheesecake. 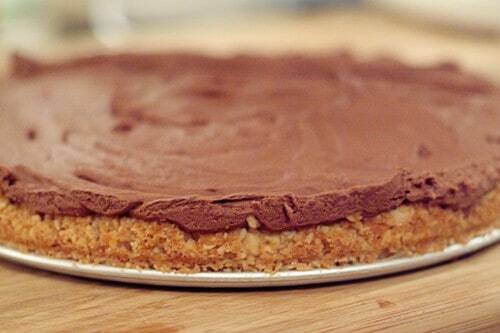 And, although the title says it’s no-bake, you do actually bake the crust but not the filling. But don’t let that keep you from trying this one. The short baking time for the crust doesn’t heat up the kitchen too badly on these hot, hot summer days. The original recipe says that it makes 8 servings. I think you could easily get 12 from this. It’s nice and rich and a small slice really goes a long way. 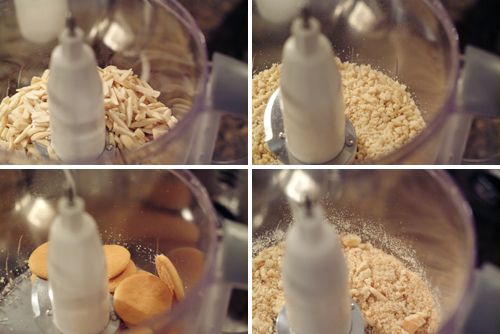 Using a food processor, pulse the almonds a few times until they are chopped but not too finely. I like to leave them coarse for a little extra crunch and texture in the crust. Do the same with the vanilla wafers. Stir together chopped almonds, vanilla wafer crumbs and powdered sugar in a medium bowl. Pour melted butter or margarine over crumb mixture; blend well. Press mixture onto bottom and ½-inch up sides of a 9-inch springform pan. Place chocolate in a small microwaveable bowl. 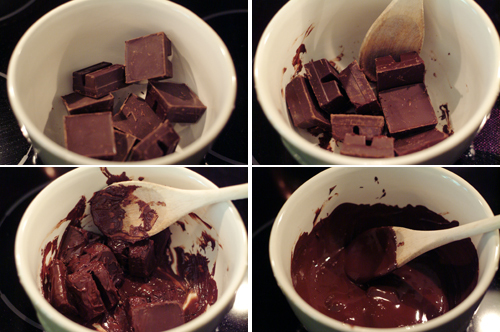 Microwave in 30 second intervals, stirring between each until chocolate is nearly melted. Set aside to cool slightly. Beat cream cheese, sugar, butter and vanilla in a large bowl until smooth. Add melted chocolate; beat on low speed of electric mixer. 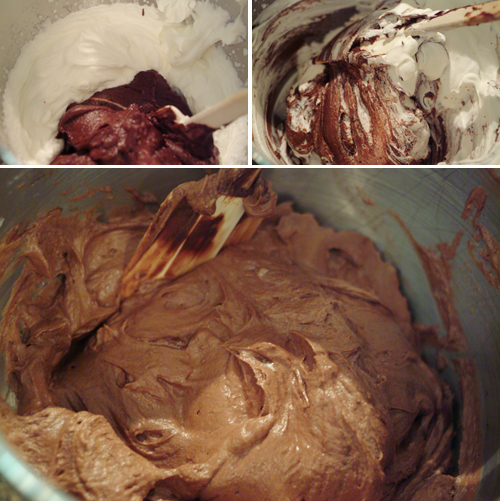 Beat whipping cream in small bowl until stiff; fold into chocolate mixture. Pour mixture into prepared crust. Cover and refrigerate until firm. 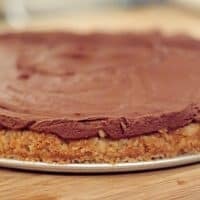 A no-bake chocolate cheesecake with an almond and cookie crumb crust. Heat oven to 350 degree. 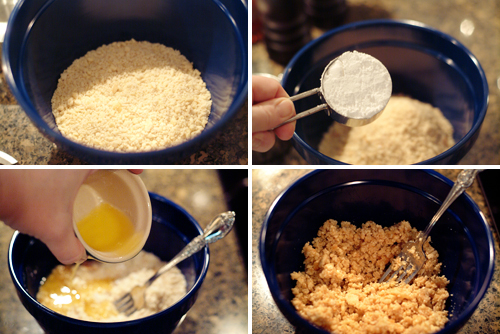 Stir together chopped almonds, vanilla wafer crumbs and powdered sugar in a medium bowl. Pour melted butter or margarine over crumb mixture; blend well. 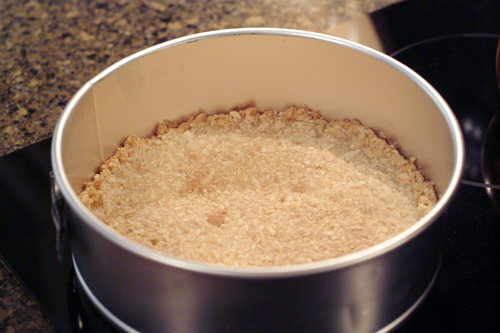 Press mixture onto bottom and ½-inch up sides of a 9-inch springform pan. Bake 8 to 10 minutes or until lightly browned. Cool completely. Place chocolate in a small microwaveable bowl. Microwave in 30 second intervals, stirring between each until chocolate is nearly melted. Set aside to cool slightly. Beat cream cheese, sugar, butter and vanilla in a large bowl until smooth. Add melted chocolate; beat on low speed of electric mixer. 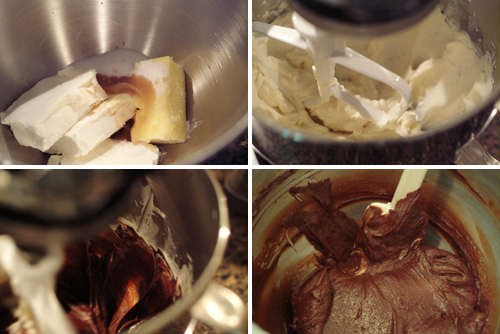 Beat whipping cream in small bowl until stiff; fold into chocolate mixture. Pour mixture into prepared crust. Cover and refrigerate until firm. Oh, chocolate. Need I say more. Oh, cheesecake. LOL. I’m a big fan of no-bake cheesecakes! It looks gorgeous really! Looks great! That’s a nice Father’s Day treat – choosing it AND eating it! You always impress me. Another great recipe. I’m IMPRESSED!! This looks scrumptious. This looks wonderful, just amazing! I’ve neer tried a no-bake cheesecake, but this one has got me intrigued! Yes, it’s a really good cheesecake. Easy, no fuss recipe, too!